24Vdc, 4 channel opto-isolated IO SPDT relay board. The 4N25 optocouplers electrically isolate the control signal of each input from the corresponding SPDT mains rated relay output. 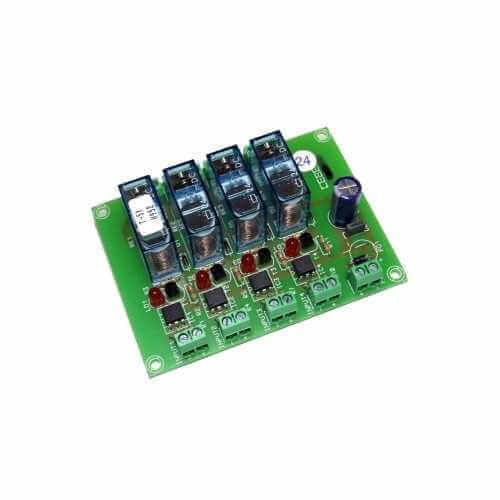 The inputs accept any trigger signal between 3 and 24V dc and the corresponding output will be activated and maintained till the input voltage decreases to zero. An LED indicates each relays status. The power input has reverse polarity protection. Screw terminal blocks for all connections. Switching Frequency 2 per second max. Electrical Isolation 1500V ac max. Load (Resistive) Up to 240Vac or 28Vdc @ 3 Amps max.